Hello everyone!! I’m here again with CS Take It Make It: Take a Technique for our February Challenge. Our theme is Stenciling!!! No specific stenciling technique, just make sure you use a stencil somehow, somewhere on your project. Remember, if you do not have stencils, cut or punch shapes from a piece of cardstock or acetate and use that as a stencil. Take a look at my colorful background!! I used my Hero Arts Stone Circle Pattern Stencil and Distress Ink Dried Marigold, Wild Honey, Picked Raspberry, Salty Ocean and Mowed Lawn to create all of those Easter egg looking shapes. I used my new Pretty Pink Posh Peek-A-Boo Die to create a window for my beautiful So Suzy Stamps Chicky with Egg stamped image. I colored my little chick with Copic Markers:Y15, Y17, Y19, B00, B02, B04, R20 and R22. 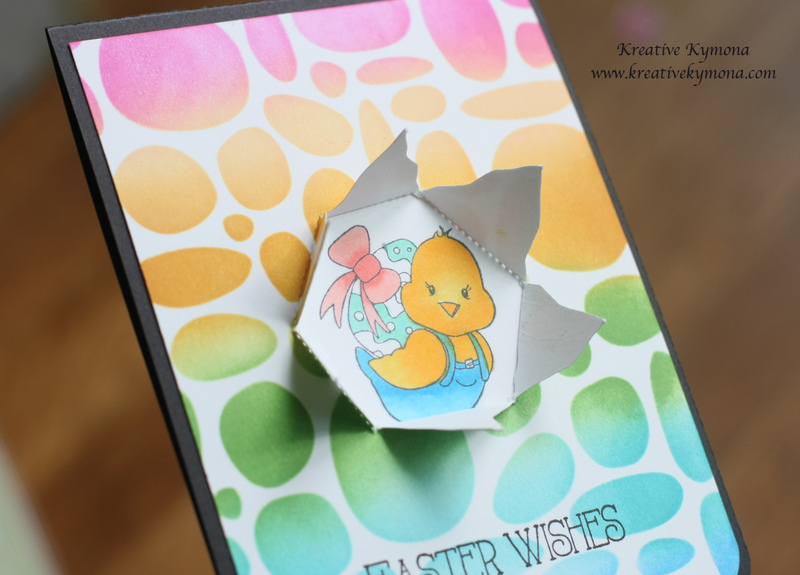 I stamped my So Suzy Stamps “Easter Wishes” sentiment with Memento black ink. I added my panel to my black base cardstock. So what do you think? Are you ready to play along with us? I hope so! The prize pack is awesome. Our sponsor is Paperbabe Stamps this month. The winner will get to pick 2 stamp plates of their choice. I hope you join us this month for this super fun challenge!! Hey Linda!! Thank you!! I fixed it. The link was correct in the direction so I hope people clicked that too. Thanks for your kind comment. Absolutely ADORABLE card, Kymona! 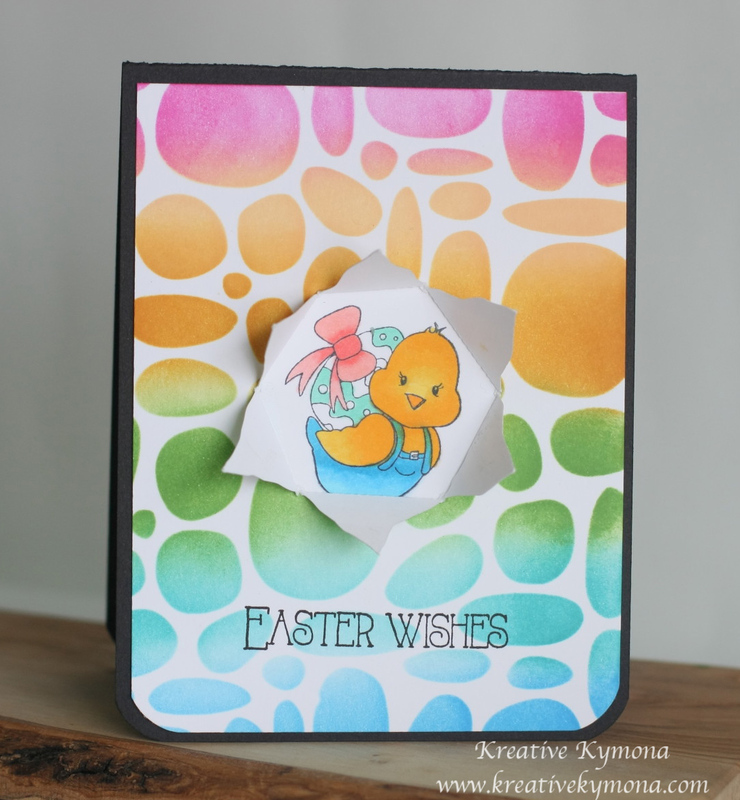 I love your stenciled background and how you played with your Peek-a-Boo die…beautiful Copic coloring, too! This is a special card. One of your best yet. Beautiful! Wow – way to blow the roof off – this is incredible, the colors are awesome and the technique is absolutely so cool!! Way to inspire others to create!!! Hey Taunya!! Thank you so much for your sweet words. You always know how to lift my spirits.